Another shot of the Tron video game atop or, here, very near the top of the old hole just south of Hucka D.’s former island home. Another trip to nearby Azure Island #6 for Blochs tonight. Below he visits the northwest corner of the island. Still no sign of a late night convenience store where he can pick up munchies. In fact no signs of stores atall. Baker conveniently keeps forgetting that most of Azure Islands is zoned for residential use only. Back on Big Island, formerly Pie Island or just Pieland, pictures and objects have finally been installed in the house. Let’s head inside, then. 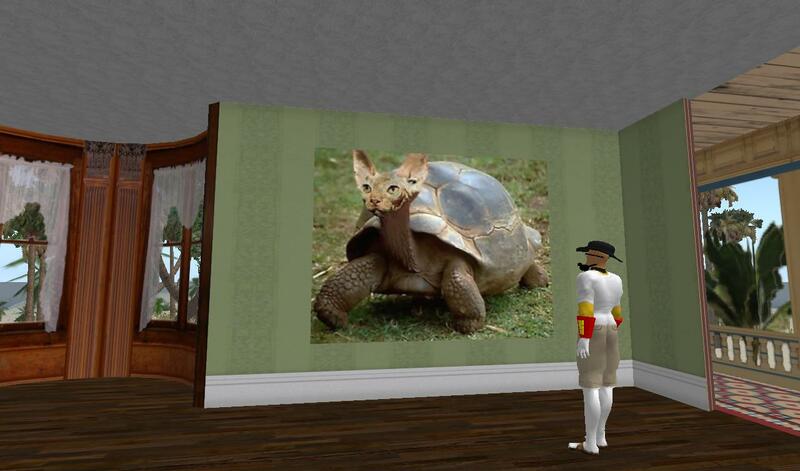 This is a cat-turtle, directly stolen, admittedly, from the UcyclopediA article on Pieland. To remind, *that* Pieland is not quite the same as *this* Pieland, but there are resonances still, and this is one of ’em. For Hucka D. claims the cat-turtle existed on both, and was just as important to the Comet Archipelago’s Big Island or Pieland as it was the UncyclopediA’s Pieland, which made it their national symbol. A new wrinkle in this story has unfolded: both Chesaw’s pet cat and the cat-turtle in this picture have the same name: Max. I wonder what that could mean? Pretty easy, I think, to draw a straight line between numbers 1 and 2 here. Hucka D. states this is a picture of Chesaw, called Lord Chancellor Chesaw in the object’s description. But it too is stolen from Uncyclopedia. 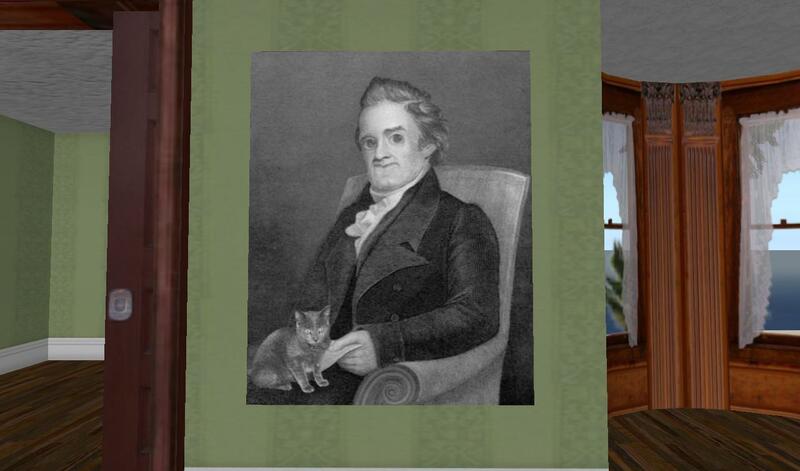 There it is claimed to be a picture of This Guy, a known kitten huffer and supposedly born in “Somewhere, Nowhere” — sounds a bit like Big Island. And that’s Max he’s holding in his lap. That name’s my own twist to the story. 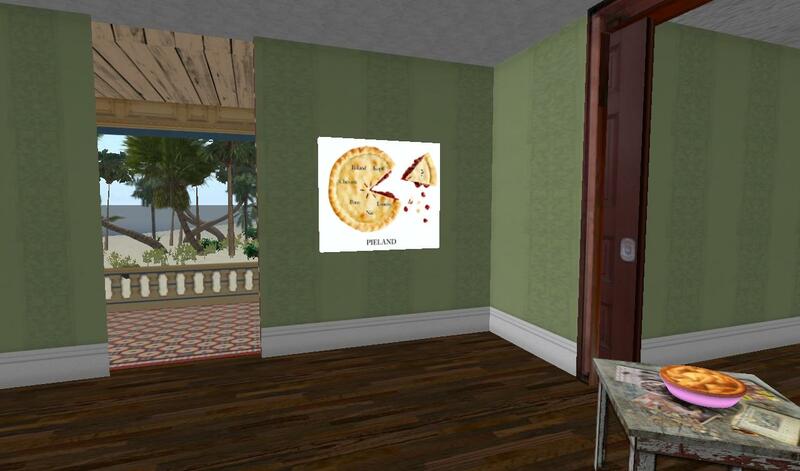 Looking around the room, we can also take in a picture of a pie with the 6 sim names making up Pieland around its center, and with a “7th” piece with “?? ?” on it just being removed for eating purposes. 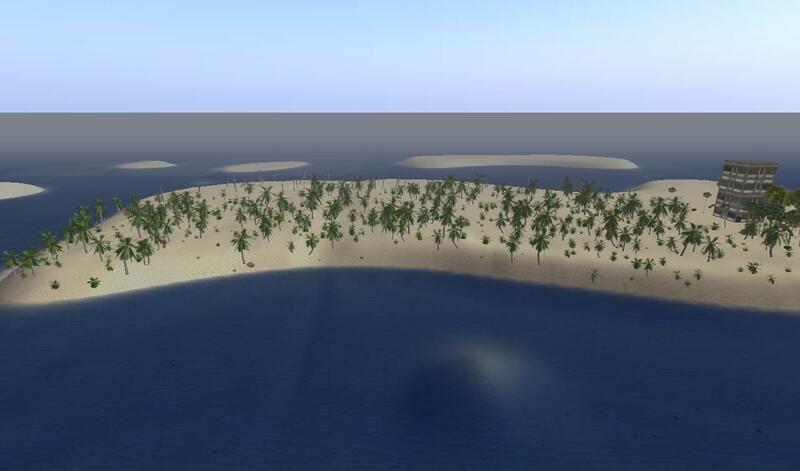 The 7th, again, is the unknown sim that originally contained the 7th and last piece of Big Island/Pieland, since deleted from the SL grid. And then directly in front of that we have an actual, virtual 3d pie. Take a slice while you’re there! It’s an original by the good Lord Chancellor himself, a pie making expert to say the least. Perhaps the best baked goods in the entire metaverse, according to some. Too bad they don’t make avatars with functioning taste buds like they did in the grand, pre-Linden days. The good old days. The only days where a greatly refined avatar like Lord Chancellor Chesaw could find his true element. Only the, um, shell of that remains. Then upstairs we come across a room in more disrepair, with a picture of what looks like Lord Chancellor Chesaw with a mustache. It’s not: it’s Chancellor Lord *Saw-chee* instead, his twin brother, perhaps. Notice how he’s facing the opposite way from Chesaw just below… that’s another clue to the difference. More on C.L. Saw-chee soon. 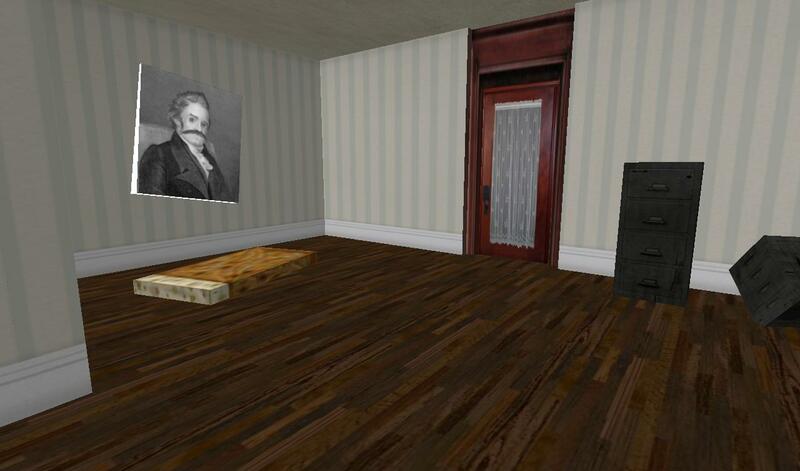 More hobo-like objects in the upper room, all courtesy of Arcadia Asylum except for the Saw-chee portrait. View toward Chesaw’s old place from the top/north of Big Island during darkness. You can still see the mountain-like Mole Hill. The next day, well night, Baker Bloch decides to fly over to one of the larger Azure Islands he is more unfamiliar with. This would be the relatively new island — let’s call it Azure Island #6 — wedged between the largest of these islands to the west, or Azure Island #1 in this blog, and the Comet Archipelago to the east. In other words, it’s between my old Azure Island homes on #1, and my new AI home, although there’s no land bridge between this newish, large island and Azure Island #1 as yet. But you can reach it directly from Comet Archipelago, which Baker accomplished this night. 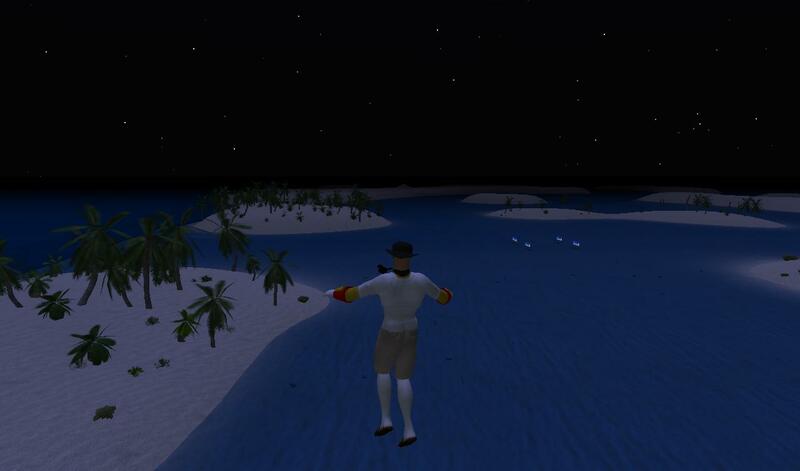 Below shows a flying Baker heading away from Big Island centering his archipelago and toward Azure Island #6. 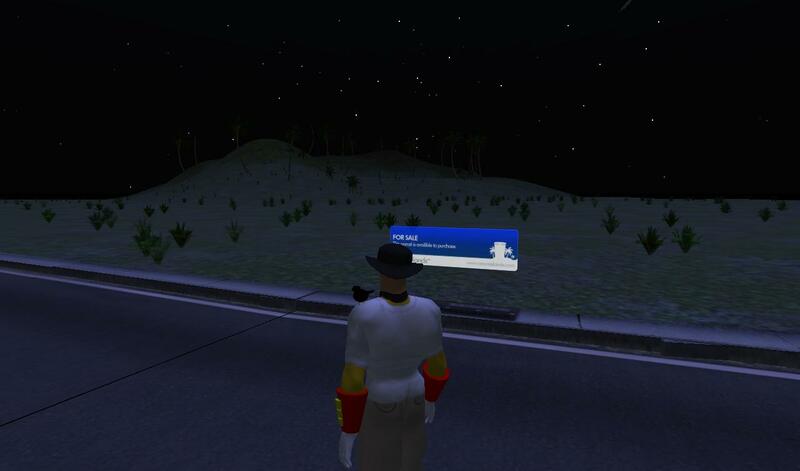 You can still see that sandy knob even from several sims away. So surprising since it’s only several meters high. 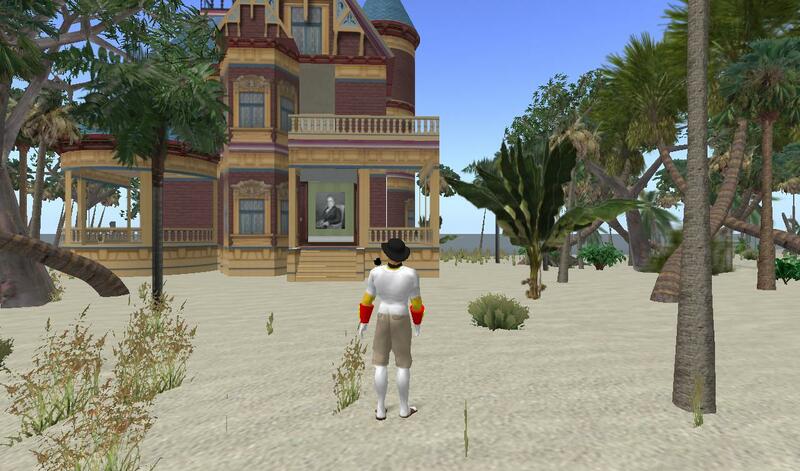 Baker safe and sound on Azure Island #6, which is centered by a protected sim. I’m sure Baker will be visiting this island again in the very near future; tonight he’s just scouting around. The island, like several of the majors ones of AI, is obviously volcanic in origin. 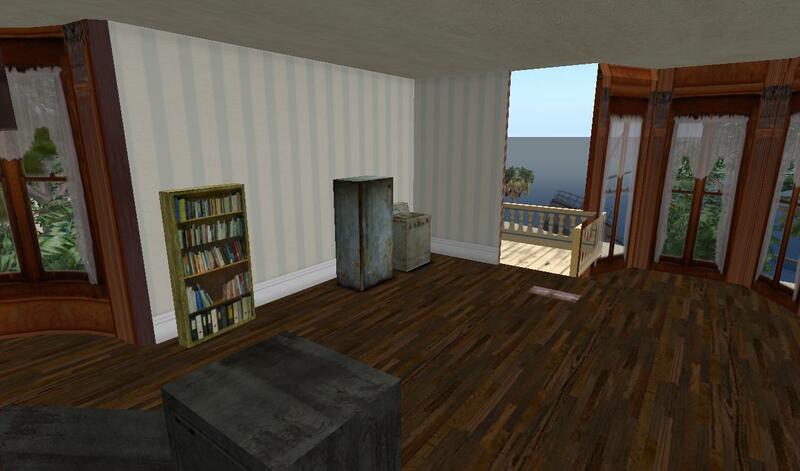 He finds a double to his first, real SL house on the western side of the island. Inside is arranged quite differently, though. Interesting way that the owner has opened up the walls in the back. 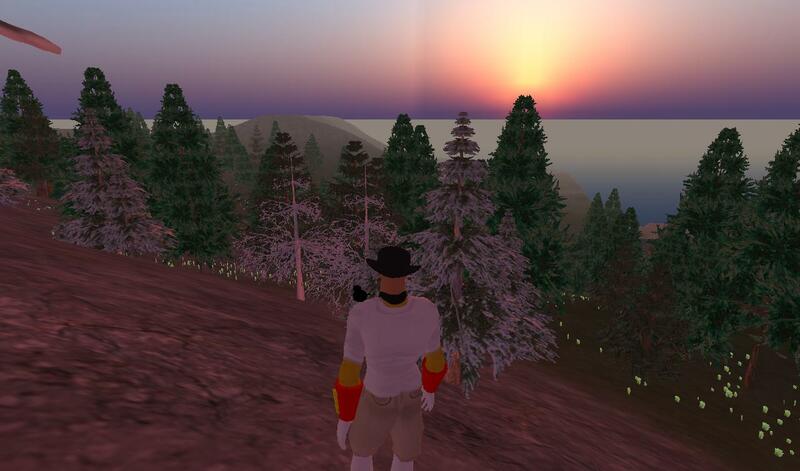 And Baker also teleports over to Azure Islands #1 this night, just in time to see the sun rising while standing on its familiar, central mountain range. 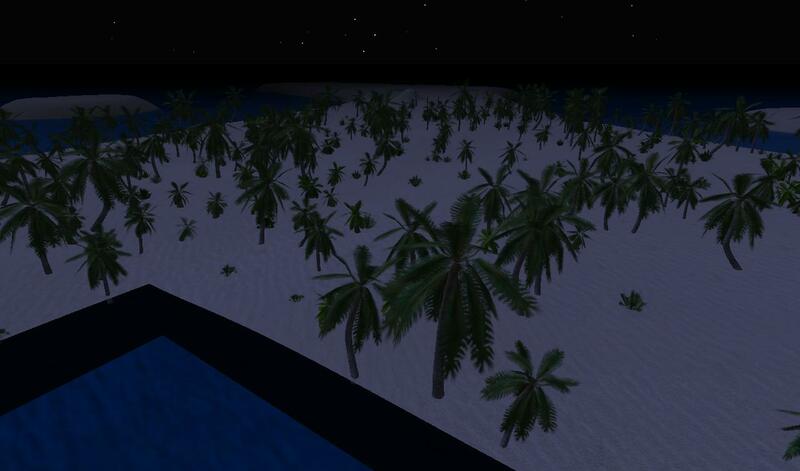 This is over the still intact forest in the Vasyutin sim. Unfortunately, most forests on the island, the ones I certainly enjoyed when I lived there, have been heavily logged, we’ll say. As I said, it’s not the same place that I knew, and I probably will not move back. 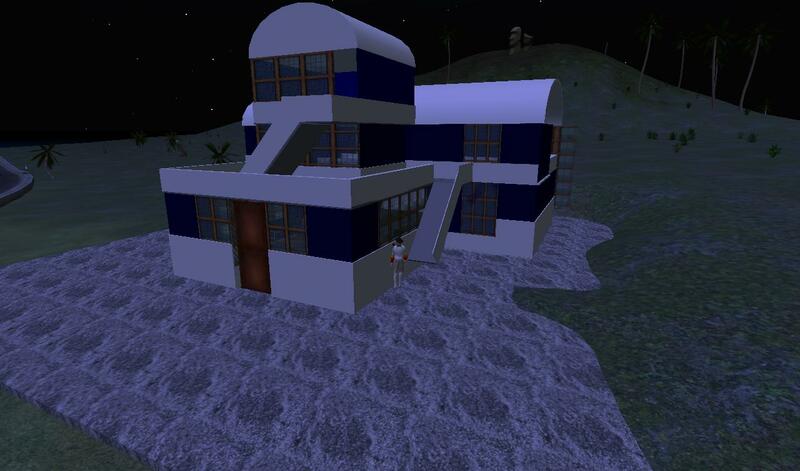 Back to my *new*, presently cheerier Azure Island home and the beachfront Hucka D. claimed he lived on. You can see that Flynn’s house is gone now, and I also wanted to show the prominent, round knoll in the water just offshore. This can act as a guiding landmark for re-finding the position of Hucka’s old haunt. Maybe this knoll even has its own story to tell. 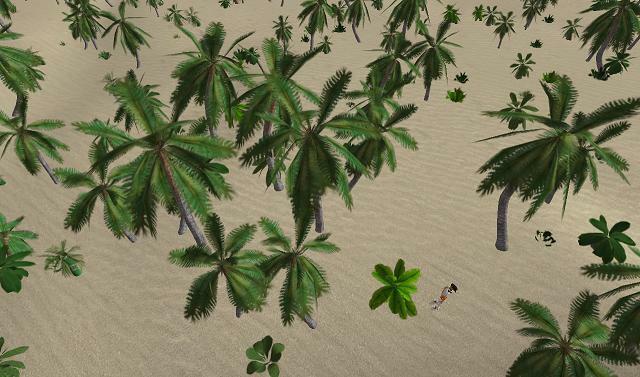 The clump of palms, Hucka D. claims was positioned right behind his old beach house on the island. Hucka D. is now also claiming that something is buried in this mini-grove, but hasn’t clearly indicated what yet. Can’t wait. Close up of a plant growing directly into the trunk of one of those palms. Is this the same, possible trail that Baker Bloch found the day before? 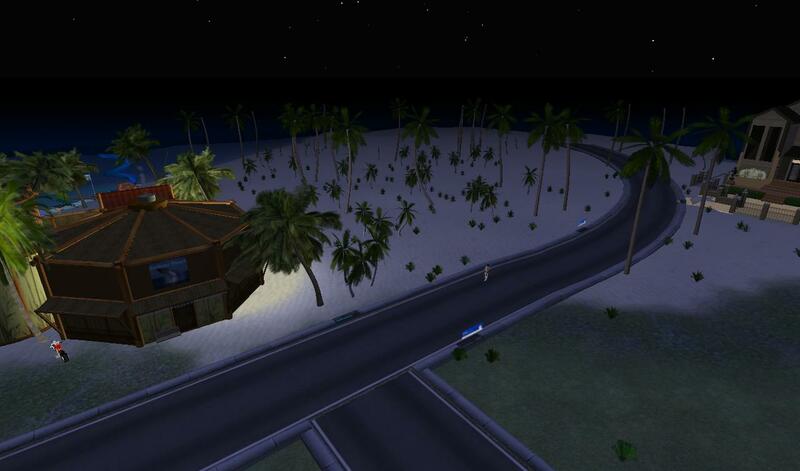 Anyway, this, again, leads away from the beach at Hucka D.’s claimed, old homestead. I wonder if he had a name for it?